Yes, there are these moments when you are overwhelmed by the beauty of a place. This is where I want to be, this is where I want to stay! 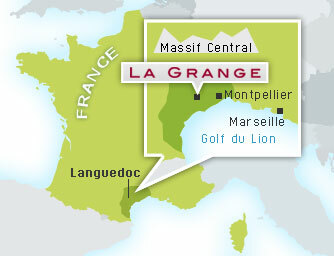 That is how we felt when we first visited La Grange: the extraordinary location close to the Haut Languedoc national park, and the vineyards surrounded by flowering hedges and bushes and pristine nature have enchanted us from the very beginning. 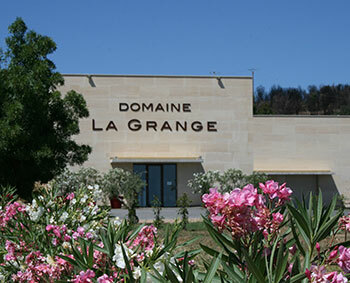 It was clear from the start that La Grange is a place where great wines can be produced. The many medals we have received for our wines have proven this. We are particularly delighted about the 94 Parker points we received for two of our wines (Castalides). A walk through our vineyards shows the specialties of La Grange: A fringe of a bush forest, the Garrigue, protectively runs alongside our vineyard and thus creates a balanced biosphere. The air is filled with the rich scent of rosemary, thyme, and in the spring the blooming gorse casts its warm yellow reflections on the vines. There is the warm climate of the Mediterranean but also a constant fresh and clear breeze coming from the nearby Cevennes. Both help in keeping our grapes healthy. We work with passion in producing great wines. Jean Natoli, one of the great Mediterranean oenologists, and his team support us in this endeavor. Together with him and his partner Gwenael Thomas we conducted precise analyses of each lot, evaluated the results and planned the working process in great detail. Now each variety grows in the perfect location. Intensive treatment of the soil, short cut spruces, small hectare yields, careful control of the time of ripeness, precise analysis of the perfect location for each variety, separate vinification of the lots, fermentation at controlled temperature, careful aging in best quality oak barrels are the many milestones on the way to success. We are member of TERRA VITIS, a well-organized association which advocates sustainable winegrowing and biodiversity in the vineyard. It is thus not surprising that birds, butterflies, lizards, beetles and plants feel at home in our vineyard. Unfortunately, wild boars are also very fond of this place and occasionally pay us a visit.